Left to right: Sgt. Chad Hill, Mother’s Quilt founder Sheri Bradway, Sheriff Aaron Rovenstine and Tom Bradway with a fallen officer’s quilt. 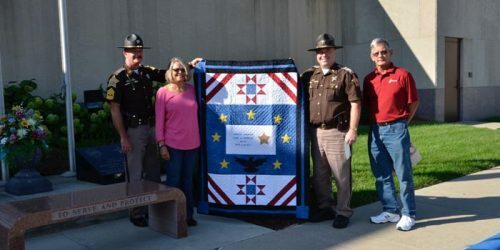 WARSAW — The Kosciusko County Sheriff’s Department made a $500 donation to a local organization that makes quilts for the mothers of officers killed in the line of duty. 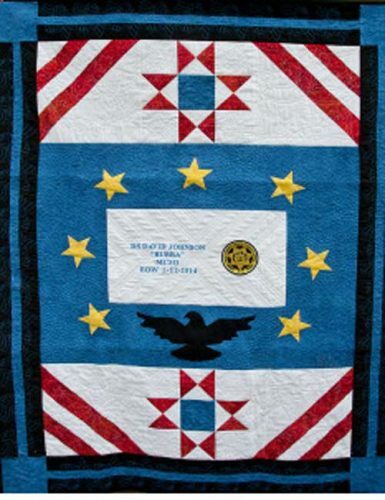 A Quilt for Mother’s Tears was established by Sheri Bradway after her son, Indianapolis Metropolitan Police Officer Rod Bradway, was killed in the line of duty. To help cope, Sheri took to quilting and created the first quilt for her son. After attending National Police week in 2014, Sheri had the idea that all mothers of fallen officers deserved a commemorative quilt of their own. Sheri works with quilters locally and across the country in a group effort to make the quilts. She has quilters throughout the state, as well as in New York, California, and Texas. While the quilting technique changes quilter to quilter, each quilt follows the same pattern. Sheri explains that the seven stars represent the seven days of the week an officer is watching over people, the eagle represents an officer’s pride in his position, the red star and cross pieces represent the families and communities served, and the blue line represents the police force against evil. Every quilt features the fallen officer’s name in the center, and Sheri tries to include the patch of the officer’s department. While the time it takes to make each quilt varies by quilter, it typically takes around one month to complete. Each quilt, including fabric, threads, batting, shipping materials and presentation costs approximately $125. Mother’s Quilt Foundation, Inc. is holding their annual fundraiser, A Quilt for Mother’s Tears Auction, 1 p.m. Saturday, Oct. 1, at Pike Performing Art Center, Indianapolis. In honor of the foundation, the Kosciusko County Sheriff’s Department donated $500 towards a quilt to be auctioned off. Sheri stated that she hopes the donation can spark the interest of other police and sheriff departments to participate and promote A Quilt for Mother’s Tears. For more information or to donate go to A Quilt for Mother’s Tears website. A Quilt for Mother’s Tears is a 501c3 tax-exempt foundation.